Enter Alex Caldiero, writer, poet and all round improvisational spoken word artist - a brave move and one that perhaps makes more sense on paper than in practice, given the magnified potential for lack of direction. Looking a little like Ricky Tomlinson on the inlay, Caldiero's vocal performance is undeniably skillful. This is edgy, conceptual stuff and certainly makes for a challenging listen. The problem is that the music itself is equally as troubled. The Invitation, for example, is a distant relative of Dead Flag Blues. By adding Caldiero there was always the danger of over-egging the tension cake. 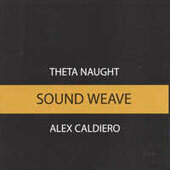 Another misgiving of mine is that Theta Naught's already sinister, imaginative and provocative music is in danger of becoming too rigidly defined by the addition of our poet. No space is left for listener interpretation as most of these pieces will forever be associated with Caldiero's bewildered ravings. A case of something added, yet something distinctly taken away. I am sorry to have to say too that the overall objective has failed. Instead of augmenting their sound with vocals, Theta Naught have shifted to the point where they are effectively backing their guest. From a poetry perspective this may be quite an exciting development, but from a music perspective, MY perspective, this wasn't the emphasis we wanted. At least they tried though and in places the exercise shows glimpses of what might have been. The lazy Parts is another jazzy GYBE and the ambient That One is a stunning success that recalls the work of Angelo Badalamenti. Elsewhere though, the record is droning and bloated. One huge entry in the credit column for Theta Naught – they provide a bonus disc. Eight instrumental interpretations of the same pieces! Redemption then for most of the negatives above, but since this wasn't the project, this lovely 2nd disc cannot justifiably be the review subject. I feel like the kid in the Emperors New Clothes. Maybe I just need a smoke? I understand the album to have been recorded spontaneously, though, which has to be admired! And there will certainly be listeners who will truly appreciate this. Sound Weave is a horses for courses record. If you favour the idea of improvisational musicians working with spoken word artist, then it does what it says on the tin! If that isn't your thang, maybe take a rain-check. Simple.